Birth 18 Jun 1764 Bradford, Essex Co., Mass. 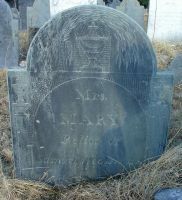 Died 1 Nov 1818 Bradford, Essex Co., Mass. Father ELIOT PAYSON, Jr., b. 16 May 1737, Rowley, Essex Co., Mass. Mother MARY HASELTINE, b. 18 Jun 1741, Bradford, Essex Co., Mass. Family SAMUEL WEBSTER, b. 25 Sep 1761, Bradford, Essex Co., Mass. Also known as Polly Payson.